5G is the next generation in over-the-air telecommunication standards. Compared to 4G, 5G boasts tremendously improved data rates and significantly lowers latency to cellular devices. 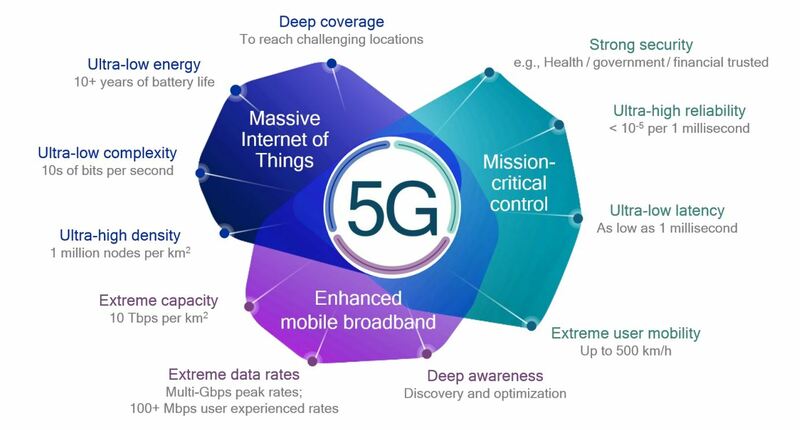 But 5G’s benefits encompass more than just telecommunication; it’s designed as a unifying network that can help realize the true potential of Internet of Things, vehicle-to-infrastructure (V2X), and far more robust virtual reality (VR) and extended reality (XR). The equipment is also highly scalable according to traffic demand, laying the foundations for devices that have yet to be conceived. Transitioning to a new network era requires more advanced technology stack. 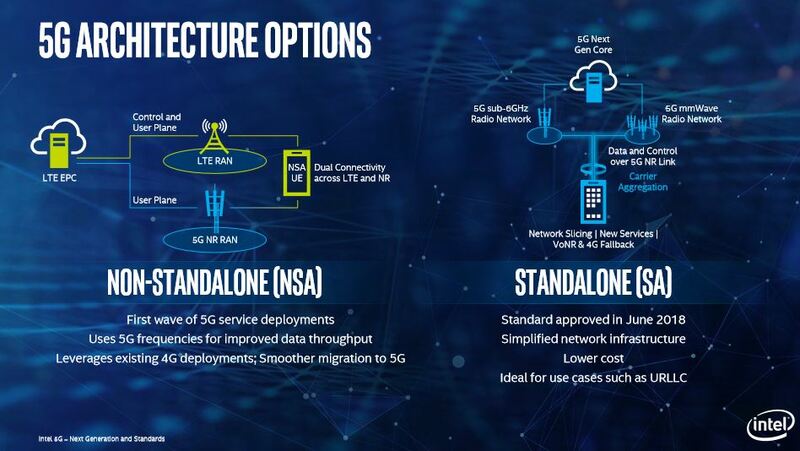 For 5G, the collection of technologies congregated under the banners known as 5G New Radio (5G NR) and 5G Core network (5GC ). The initial phase of 5G deployment will use the existing 4G Core network equipment, with a dedicated 5G Core network deployed later on. All wireless networks are divided into the core network, access network, air interface, transport network and service, and network management. 5G sees innovations in all these areas. The first generation (1G) wireless standard was established in the 1980s. In just short 40 years, wireless communication has transformed into an absolutely critical component of the modern infrastructure. 1G: Primitive over-the-air analogue signals for voice. 2G: Digital signals with better service area and voice quality, introduced basic mobile internet, text messaging and MMS. 3G: Increased internet speed, more robust internet services. 4G: Improved service speed bringing mobile internet to the masses boosting smartphone usage. IP-based telephony. A strong network is the foundation for effective communication between all things. 5G’s benefits open up endless use cases. For starters, smartphones will be able to stream 4K HDR content at higher frame rates. Imagine downloading a few gigabytes in just seconds rather than hours. Latency will be lower, too, so over-the-network responses like web requests will feel snappier. 5G can also address extremely high-density access. Event locations like stadiums often have tens of thousands of attendees. 4G technology can have difficulty handling such massive access. With 5G, IoT will no longer be constrained by network resources, unlocking the potential of smart devices. A potential application could be security. When an infrared sensor is tripped, it could automatically activate the security camera and send the feed to a smartphone or a security company. At the same time, it could immediately notify an available officer in the area. Another could be disaster prevention. For example, temperature sensors in forests could alert the fire watch teams in national parks if temperatures reach unsafe levels. Vehicle to infrastructure technologies would also see more action. A city could direct navigation systems to better manage traffic and avoid dangerous areas, or automatically connect vehicles to the thousands of hotspots. 5G’s increased data rate and efficient transmission not only delivers rich, high definition content to virtual reality and augmented reality headsets, but also saves on battery consumption for edge cloud services that perform application processing. In addition, it eliminates bandwidth limitations for wireless VR and AR content, which is a major barrier that’s preventing mobile VR and AR from becoming mainstream. And that’s just scraping the surface. There are tons and tons of application for 5G that haven’t been invented yet. Think wearables, connected AI, and more coming in the future. 5G’s is as much of a technical advancement as it is an economical one. It will be used across the government, retail, education, transportation, and everything in between. Qualcomm estimates that 5G will produce up to $12 trillion worth of goods and services as well as up to 22 million jobs by 2035. The most noticeable difference is data rate. In a data-driven world, users are demanding richer media at higher resolutions. 5G delivers up to 20Gbps peak downlink, making 4G’s 1Gbps max downlink seem paltry in comparison. Even in poor conditions, 5G aims to deliver a 100Mbps minimum downlink. More devices can receive better services, too, as network capacity is increased by 100 fold. Increasing bandwidth isn’t enough. To truly improve user experience, latency has been reduced to under 1ms – 10 times lower than that of 4G. This not only enables faster service response times, but also help drive more tactile Internet of Things (IoT) experiences. The network infrastructure will receive an overhaul, too. The towering base stations will be accompanied by many of thousands of smaller base stations called microcells and femtocells. Devices would dynamically select the best cell tower to connect to without any interruptions in service. Per IMT-2020 ITU version requirements, 5G is expected to deliver up to 20Gbps. Qualcomm’s 5G-NR modem, the Qualcomm Snapdragon x50, is designed to achieve up to 5Gbps in downlink peak data rate. But that doesn’t mean 4G will be immediately replaced. Just as how 3G is still alive today, 4G will be used as an assistive network for 5G. A few companies have announced a few creative ways to integrate 4G into their products. Huawei, for example, recently announced uplink and downlink decoupling, where the uplink communicates over the 4G network, and the downlink communicates over the 5G network. MIMO stands for Multiple Input, Multiple Output and works exactly as its name implies. As opposed to sending a single data stream, MIMO breaks down the data and sends them out through multiple data streams called layers, thus increasing parallelism and improving throughput. The data stream from a MIMO radio either be arranged so they are perfectly in order when they reach the device, or mark each stream with special markers so the device would know how to reassemble them. The receiving device would then assemble the separate data streams into its original message. MIMO can also encompass multipathing where the base station sends multiple copies of the same signal in different directions for increased redundancy. This way, even if one signal is lost, the other may still reach the destination. A fundamental change to 5G network infrastructure is to its antenna array. The idea is to have more antennas serving fewer clients. Installing more antennas per cell tower, combined with higher cell density, helps tremendously in improving wireless bandwidth. While initial 5G rollout will use existing cell towers, dedicated 5G network infrastructures will have a massively increased number of antenna elements per tower – each of them separately controllable – within each antenna. 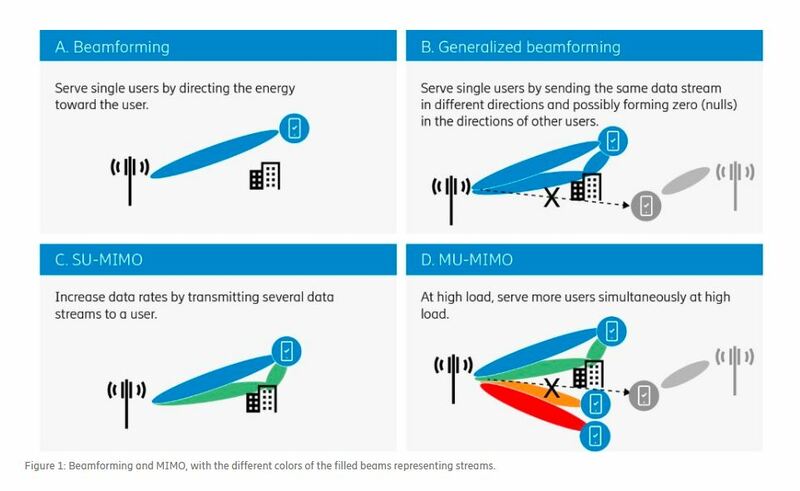 MIMO solves how to handle the massive number of connections and increasing data rate via parallelism, but it needs to work in conjunction with advanced beamforming techniques to actually deliver data to the user equipment. Beamforming is a long-established concept in telecommunications. As opposed to broadcasting the signal in all directions, beamforming directs the signal towards the receiver, minimizing interference while increasing the data rate. There’re several popular beamforming techniques, but one of the most widely adopted is changing the phase of the signals emitted from an antenna array. To do this, the emitter needs to have several antennas and a controller. First, the user’s device – be it a smartphone or an IoT device – would send out a known reference signal. The base station captures this signal, compares its characteristics to the reference, and adjusts the signal’s amplitude and phase for that device. The exchange happens a few times until it achieves the optimal quality. While an important technology for Wi-Fi routers and the like, beamforming is an essential component of 5G. 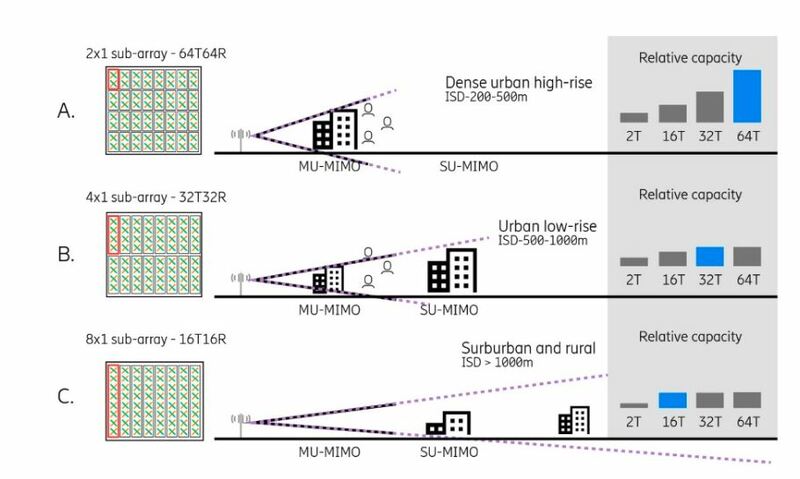 As previously discussed, 5G topology calls for an increase in base station density and therefore higher traffic in a given area. Without proper beamforming, the signals would interfere with each other. 5G’s beamforming techniques also calculate the device’s position by examining signals bounce off walls and environmental objects. In addition, since signal frequencies at 5GHz and above have almost no penetration ability, they necessitate beamforming – specifically digital beamforming – to be able to effectively reach their targets. But wait, there’s more. 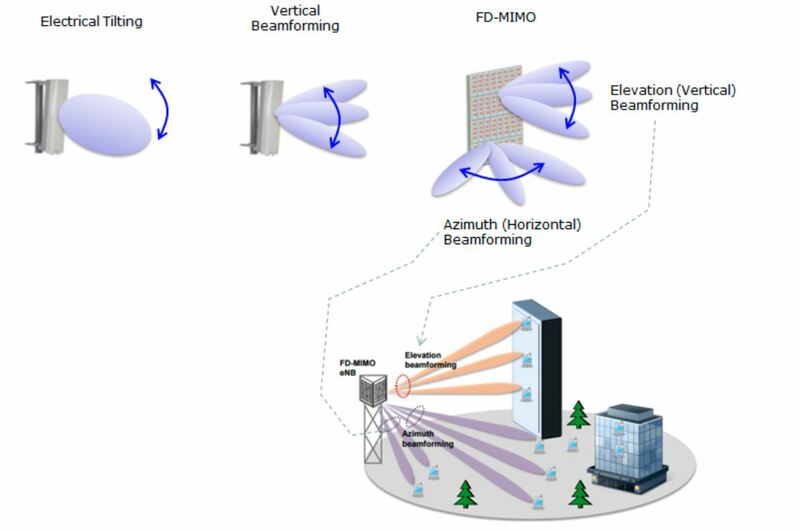 The FD-MIMO in the 3GPP 5G specification also supports beamforming both horizontally (called Azimuth beamforming) and vertically (called Elevation beamforming), far superior to the strict Azimuth beamforming in 4G. This enables the base stations to direct their wavefront towards tall buildings, over obstacles, and be installed in confined areas without attenuation. Metropolitan residents are no strangers to piercing signal towers. Each of these base stations can send signals to a certain radius, and the area they govern is called a cell. The signal tower behind your railroad track can cover an area of several kilometers, which is why it’s so tall and often perched up so high. Having a single wide area base station is efficient, but a single tower can only handle so much traffic. To deliver data to thousands of clients, the radio uses a technique called multiplexing, which rapidly switch between different communication channels. Each tower is designed to handle a certain load, and if that threshold is breached, then the network can experience interruptions or increased latency. In addition to higher data rate, 5G is designed to connect to vastly more devices – many times, more, in fact. They range from vehicles, wearables, sensors, and many more smart devices that haven’t been invented yet. The current networking infrastructures simply don’t have the capacity to accommodate the influx of connections. The solution to this problem is a no-brainer: just add more towers. The large towers will be accompanied by thousands of smaller, densely packed smaller towers to create smaller cell sites. These small cells only stretch a few hundred feet, but through doing so, workloads can be balanced across more access points, enabling higher data rate, lower latency, and stronger signals. But smaller cells means less room for antennas, and fewer antennas mean less effective MIMO and beamforming. One way around this problem is when a device enters an area overlapped by multiple cells, both towers would transmit data to that device simultaneously. Load balancing is one thing, but microcells also play an essential role in ensuring signals can reach their target. Unlike 4G, 5G uses frequency spectrums anywhere between 600MHz to 100GHz. On the upper echelon of the frequency spectrum, the wavelength is reduced to mere millimeters. The ultra-short wavelengths, called mmWaves, have both their advantages and challenges. Every generation of over-the-air communication preceding 5G has happened between the 300MHz to 5.2GHz frequency band. From Wi-Fi to air traffic control, all consumer wireless communications are finely allocated on this spectrum. Over time, this space has grown extremely crowded and can no longer support 5G’s demanding bandwidth requirements. Image source: Canadian frequency allocation table by the government of Canada. Click on image for full-res chart. Unlike the sub-5GHz space, frequencies 6GHz and beyond are largely untouched by telecommunications. As such, 5G uses frequencies anywhere between 1GHz to 300GHz divided into three key frequency ranges: sub-1GHz, 1GHz to 6GHz, and above 6GHz. Bandwidth is directly correlated to the carrier signal’s frequency and is a primary means by which 5G can transmit gigabytes of data to multiple users at once. Sub-1GHz (600MHz to 700MHz) will support widespread coverage across urban, suburban, and rural areas and help support the Internet of Things (IoT) and critical communication. 1GHz to 6GHz (3.5GHz in Canada), is expected to form the basis of many initial 5G services globally. Due to the lack of spectrum, the U.S. is more keen on developing mmWave. Above 6GHz (28GHz, 36GHz, and beyond) is needed to meet the ultra-high broadband speeds envisioned for 5G. Currently, the 26GHz and 28GHz bands have the most international support. Definite agreements on bands above 24GHz will be established in the IT World Radiocommunication Conference 2019. The specific frequency bands deployed will vary by country. Because 5G works across all frequencies, it supports all spectrum types including licensed, shared, and unlicensed bands. Canadian carriers are waiting for frequencies above 6GHz to free up. More details can be found in our interview with Nokia and Ericsson. Using higher frequencies to improve bandwidth isn’t enough, to improve spectral efficiency even further, 5G employs an improved encoding scheme called OFDM. Furthermore, 5G’s carrier aggregation is many times superior to 4G’s. Carrier aggregation is a method to improve bandwidth by combining multiple subcarriers. The 4G standard can aggregate up to five carrier signals, each with 20MHz bandwidth. In reality, however, it’s very uncommon to aggregate even four signals simultaneously. 5G-NR, on the other hand, can aggregate up to 16 channels, each ranging from 20MHz to 400MHz depending on the carrier frequency. Operating using wider bandwidth would theoretically enable 20Gbps transfer speeds – that’s 2.5GB per second! If 2.5GB per second sounds like a pipe dream, that’s because it is – at least in the current wireless spectrum. The sub-6GHz space is becoming incredibly crowded and can’t support 5G’s demanding bandwidth requirement. To accomplish this, engineers must venture into higher frequency spectrums. Up until now, the article discussed how MIMO, cell density, and mmWave can increase bandwidth and efficiency. But to better manage the massive number of connections, 5G needs a better multiplexing technique. Multiplexing describes sending multiple data streams on a single channel. 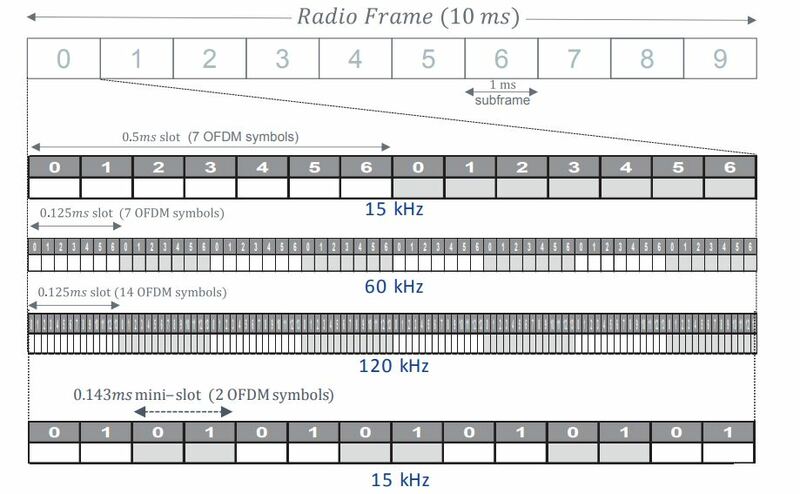 Over-the-air telecommunication deals with analogue signals comprised of sine waves, and thus, extensively uses a technique called frequency division multiplexing (FDM). FDM operates by dividing a channel into dedicated, non-overlapping subcarriers (also known as subcarriers) with a small void band in between them, called a guard band, to avoid interference. OFDM, or orthogonal frequency domain multiplexing, improves on traditional FDM by introducing overlapping subcarriers. In mathematics, orthogonal means two lines that are perpendicular to one another. When the concept is migrated to wireless communication, it means that when one subcarrier’s waveform is at its peak, the other channels are at zero. This completely eliminates interference between subcarriers without a guard band in between the carriers, thus allowing for more subcarriers on a single carrier. OFDM has been in use for Wi-Fi, 4G, and WiMAX for years now. For 5G, it needs to address the wider subcarrier bandwidth, and condense even more channels into the mmWave range. 3GPP has selected CP-OFDM, a variation of OFDM, to resolve all of these concerns. Latency has always presented a major barrier to not only user experience, but to the growth of IoT and smart devices. When critical public sectors like emergency services eventually integrate 5G into their infrastructure, responses need to be instant. 4G currently has a minimum round trip time between 10ms to 100ms. 5G will drop that down to just 1ms. Achieving this milestone is very challenging and requires the entire transmission stack to be reworked. And reworked it was. 5G introduces a much shorter transmission time interval (TTI), which is accomplished by shrinking the minimum scheduling slot length per radio frame to two symbols down from seven. In addition, it also introduces contention based access, allowing the user equipment to send data without having to wait for the base station to acknowledge a resource grant before initiating an upload. Furthermore, 5G introduces a new connected state for radios called Radio Resource Control (RRC) connected state, eliminating the need to repeatedly establish new resource allocation requests. These technological advancements benefit 4G as well. The two-symbol slot length can help reduce 4G’s minimum round trip time to 2ms. Uplink latency can be reduced by retaining pre-allocated uplink resources to reduce the need to send redundant dummy data. To learn more about each technology, please read this white paper by Nokia. Duplex is a transmission mode that’s able to simultaneously transmit and receive signals. The other type is called simplex, where only one party can transmit at a time. 5G switches to time division duplexing (TDD) from 4G’s frequency division duplexing (FDD). In FDD, the transmitter and receiver operate at different carrier frequencies. 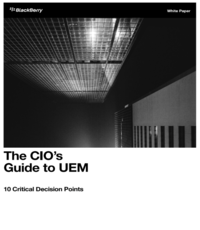 Its main advantages include completely isolated operation, steadier data stream, and better coverage. In TDD, communications rapidly alternate between transmitting and receiving, with each provisioned a length of time to operate. TDD can send and receive signals on the same carrier frequency, but is inferior in latency and fairly dividing time between uplink and downlink. So why TDD if FDD is already working fine? Firstly, spectral efficiency is paramount, and while FDD’s isolated frequencies have many advantages, they need a wider total band. Second is that FDD time slot management has improved by so much that the two problems are basically null. With that said, FDD is still needed, especially in scenarios where coverage and penetration take precedence. All 5G modems will support TDD as well as FDD when it falls back to 4G. One of 5G’s key advantages is that its network can be virtualized, and that’s important for power saving for operators. In previous network generations, the cables run from the antennae into a processing unit at the base of the device. Under load, these processors can get extremely hot, and need seven to eight air conditioning unit to keep them running. As one can imagine, cooling hundreds of thousands of these processors can be extremely costly and inefficient. 4G alleviated this somewhat by centralizing the baseband processors into large groups so the units can be cooled collectively. Unfortunately, the radio units, called a front haul, can only stray a few hundred meters away from the baseband processors. 5G takes this to another level by adding virtualization, meaning that traffic can be software-defined and centrally allocated. Their fronthaul can be placed up to tens of kilometers away, which allows for more baseband processors to be grouped together and cooled using centralized AC. Rohde Schwars says that this can reduce power consumption by 70 per cent. Cheaper for the owner and better for the environment, a win-win scenario. There is a caveat, however. To prepare for mmWaves, 5G-enabled phones need to have multiple antenna arrays to prevent the user’s hands from blocking the signal. This could increase battery drain if they all fire simultaneously. Manufacturers can mitigate this effect by having the device detect which antenna has the best signal and turn off the ones that are blocked. The big three Canadian carriers – Bell, Rogers, and Telus – have been developing 5G infrastructures for years. In recent times, Huawei, one of the key investors in Canadian 5G technology, has rubbed the wrong shoulder with the US and Canada due to privacy concerns and allegedly avoiding a US trade sanction. As it currently stands, Canadian carriers are partnering with Nokia and Ericsson to continue their 5G development, with Huawei’s equipment being hotly contested due to security concerns. There are many hurdles 5G needs to overcome, some foremost concerns are highlighted here. The first is attenuation in the upper spectrums. Because mmWaves lack penetration capabilities, they can’t go through anything, and can even be affected by weather like rain and heavy fog. In its 5G Wireless Network Planning Solution Whitepaper, Huawei estimates in the maximum and minimum loss scenarios, the signal loss due to obstacle penetration in high bands is 10-18dB and 5-10dB respectively higher than that of low bands. Remember that decibels operate on a logarithmic scale; every 10db decrement means a factor of 10. This is why beamforming and high cell density is so crucial. Without it, nothing would get transmitted. Increasing the number of cell towers in an area means more expenditures for the owner. In addition, in a densely packed metropolis, space is a scarcity. City planners need to painstakingly figure out the best locations to place each tower. Having more towers also means more potential points of failure, which could drive up maintenance costs. According to a Vodafone infographic on Statista, world data consumption is expected to hit 701 exabytes by 2021. Transporting all that data between two separated base stations requires high-performance fiber optic cables. As one can imagine, pulling miles and miles of fiber optics across the country can be expensive. 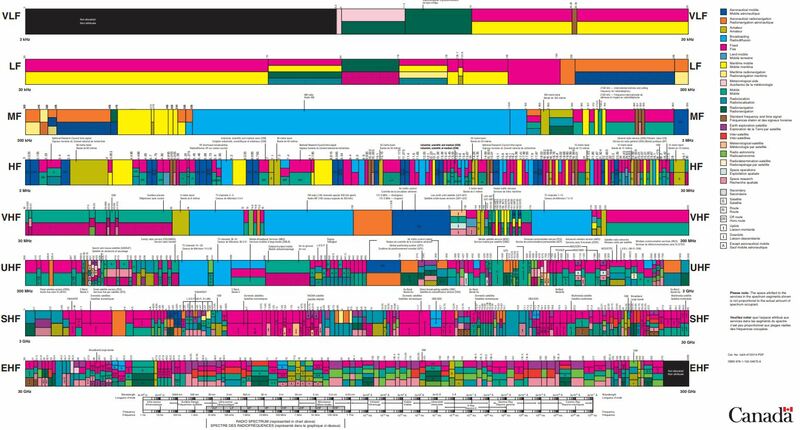 Spectrum usage rules and constraints such as licensing and admission policies vary with different frequency bands, which complicates spectrum planning. When will 5G arrive in Canada? Canadian 5G spectrum auctions will begin in 2019 and conclude in 2021, starting with the sub 6GHz bands first. The auctions will be divided into three segments: sub-1GHz for outdoor to indoor penetration, 1Ghz to 6GHz for balance between coverage and carrying capacity, and above 6GHz for massively increased data rate. Compatible hardware is already here. In 2018, Qualcomm released its Snapdragon X50 modem capable of delivering up to 5Gpbs maximum data rate – five times higher than the maximum data rate of 4G. Qualcomm has already announced the updated Snapdragon X55 modem, which further increases the throughput to 7Gbps and brings the new QTM525 mmWave antenna, TDD support, and antenna tuning support.